December 16, 2017 – Moultrie, Ga.
Mattco Realtors recently announced the addition of Judy Burnham as a new associate broker. 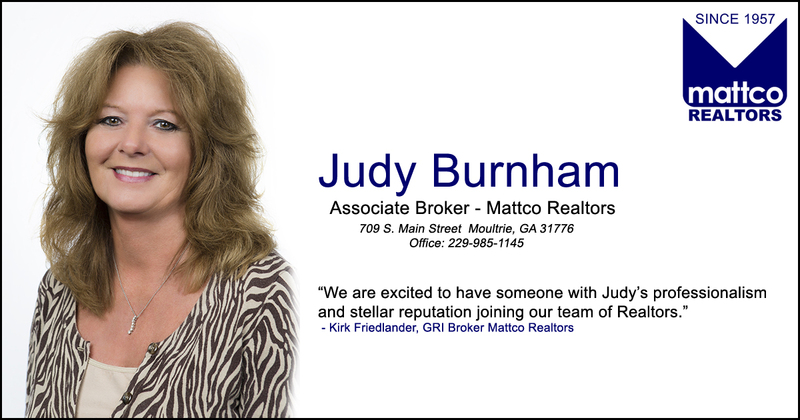 Judy has been a successful real estate agent for more than ten years in the Moultrie and South Georgia market by achieving the Multi-Million Dollar and Platinum level in sales. She is currently serving as a state director for the Moultrie Board of Realtors. In previous years she has served as treasurer of the Moultrie Board of Realtors. She was voted by her peers as the 2014 Realtor of the year of the Moultrie Board of Realtors and was nominated for the Georgia Realtor of the year. Burnham is also active in the Moultrie-Colquitt County Chamber of Commerce as a current board member and chairperson of the chamber Ambassadors.